One of the best pike waters in Poland. Hectares of underwater meadows, centers of plants, deep waters and – what is of most interest to us – pike. Our good guide will show you suitable spot, advise which bait to use and how to lead the bait. It’s not easy because Zarnowiec lake follows its own rules. The water level changes very often (the biggest pump storage power plant in the country is located there), and so do the spike fisheries. When to go to one meter 50 cm deep? When to use the wobbling? Or maybe an underwater meadow is the best spot, and a rubber on the proper head is the best bait? Our guide knows the answers. Be ready for big emotions. Your equipment mustn’t be all too light. 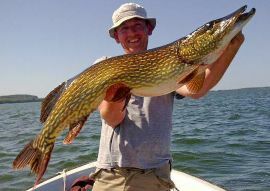 This water is full of real crocodiles – it’s here where you may join the group of anglers who may boast to have caught a pike in Poland, and not Sweden, which was more than 100 cm big. The record pike caught by our guide was 128cm big! Zarnowiec lake surface is over 1,400 ha, the length is over 7km, the width – 2km. The maximum depth amounts to 20m. After fishing, there is another place of interest to be seen – the remnants of the nuclear power plant planned in this place. The flow-through lake is located several km from the sea. That’s why is treacherous – the weather changes often and waves may be really high. We offer, however, suitable boats in which you can fish without worrying about the weather, and which can fast reach the shore if the weather breaks. Prices from 1 to 2 days of fishing with a guide (price per person per day). 150 EUR per person - one person on the boat. 100 EUR per person - two persons on the boat. Prices from 3 days fishing with a guide (price per person per day) . 130 EUR per person - one person on the boat. 90 EUR per person - two persons on the boat. In the case of a larger number of people (max 5 persons), fishing with guide we realized on two boats. 3 persons + guide on one boat, two persons + guide for the other boat. The price includes: fishing with professional guide, fishing boat with engine, fuel, buoyancy vest. Rod, reel, line (full set) - 20 EUR per person per day. Lures - 20 EUR per person per day. If you want to make a fishing expedition or if you want to hire a fishing guide or if you have any questions, please email us or call. Enjoy! I have been interested in fishing since I was a child. I’m a passionate of all angling techniques, first of all these where you can meet big fish. That’s why I spend most of my time fishing pike, as well as carp and trout. I have been hunting for pike for over 10 years now. The Zarnow lake notorious for pike which are over 100cm long is my basic fishery. I use the spinning, trolling, and sometimes I fish with live baits. If nothing happens, which is really rare here, I use jigging to catch perch, there are plenty of them in the Zarnowiec. I have so far caught several dozens of pikes over 100 cm long, the longest was 128cm long. In my free time, I fly fish. I was Poland’s champion in team championship in 2006.